"Sukham laati prakashayati iti kalaa"
I read somewhere this line "Every artist dips his brush in his own soul, and paints his own nature into his pictures." I met someone who really did this. Here is something about him. Govind Dumbre was born in Otur, a village near Pune, Maharashtra on 29th December, 1971. Right from childhood, he displayed an enormous capacity to paint. Nature mesmerised him. He knew that fine art was the career for him. 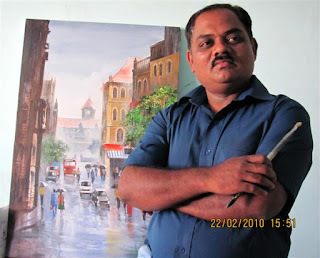 He did his Art Master from Abhinav Kala Mahavidyalaya, Pune and Government Diploma in Art (Painting) also from Abhinav Kala Mahavidyalaya in 1996. Since the past 15 years, he has been painting landscapes on canvas and paper. Since the last few years, he has also been teaching art at Chitari Academy of Fine Arts, Camp, Pune. Govind Dumbre is famous for his watercolour on paper and acrylic on canvas paintings of rainy landscapes. Reflections in water and watery-ground are his forte. He has travelled all over India to paint landscapes. He has been to places such as Himachal Pradesh, Benaras and, particularly, the Konkan region of Maharashtra which is his favourite. On the spot, he paints in watercolours and then in his studio he improves and enlarges the painting while applying acrylic on canvas. His speciality is that his canvas paintings have transparency too. He loads colour with a knife. There is also good flow in his paintings. He includes rain-drenched cows, goats and human figures. His paintings of foggy weather have a cooling effect on viewers. On any given day, you will find Govind idly immersed in painting a rainy day in the Konkans, applying their typically heavy tones. He has held ten solo & fifteen group shows in art galleries in Pune and Mumbai such as Malakka Spice, Hotel Sun & Sand, Rudraksh Art Gallery, Bal Gandharva, New Art Gallery, Hotel Trident (Oberoi), Jehangir Art Gallery and Art Walk. He has also participated and won prizes in Kala Pushpa Art Competition, Sangli and Kala Niketan, Nasik. He is the recepient of many awards such as Maharashtra State Art Competition and Exhibition, Mumbai and V. V. Oak Memorial National Level Art Exhibition, Pune. Govind is affiliated with many art societies such as Bombay Art Society and The Art Society of India. He has participated in many prestigious art exhibitions such as The State Art Exhibition & Camelin Art Exhibition. He has given demonstrations at V. V. Oak Memorial National Level Art Exhibition, Society of Indian Marine Artists, Tilak Maharashtra Vidyapeeth (College of Animation), Sai Chitrakala Mahavidyalaya and Atur Sangtani Memorial Exhibition among others. His paintings can be found in the collections of many prominent organizations as well as individuals in both India and abroad. Govind Dumbre believes in the maxim "Be quiet, be creative". He is a noble man who lives simply and has a lot of understanding and wisdom. He is quite passionate about painting. His upbringing in a rural atmosphere has influenced him and his painting to a great extant. He loves to paint idealized village scenes. He is a lover of nature and he loves to be alone painting amongst quiet and peaceful natural surroundings. Nature stimulates him. The artist lives and works in Pune.